The new UK Five Year Antimicrobial Resistance Strategy reflects growing international interest in Antimicrobial Resistance as an economic as well as health concern. It indicates the cross-government and cross-sector approach needed to address one of today’s greatest public health issues: the increasing resistance of microorganisms – including bacteria and viruses – to the drugs that are used against them. The strategy was originally expected to be published in early 2013, following a consultation on a draft version issued in October 2012. However, cross-government consensus takes time, and its later publication has provided an opportunity to address the points raised in the Chief Medical Officer’s Annual Report, published in March 2013. The development of the strategy has been led by the Department of Health and the Department for Environment, Food and Rural Affairs (DEFRA), in collaboration with the devolved administrations, the Department for Business, Innovation and Skills (BIS), the Ministry of Defence and others. More than 130 organisations – including RUSI – contributed during the consultation process. AMR has long touched the edges of a number of defence and security issues including immigration policy and border screening, where the challenge is how to prevent the spread of drug-resistant tuberculosis, gonorrhoea and other diseases into and around the UK by leisure and business travellers returning home, as well as from those seeking immigration. AMR also affects the management of international aid to refugee camps (more than 90 per cent of the cases of dysentery in some camps can be resistant to the two most common frontline drugs) and the response to pandemic flu, which would become even more serious if the flu strain involved was drug-resistant. In the UK, the Department of Health has considered how AMR affects existing National Risk Assessment emergency scenarios and has agreed to consider how it affects UK security interests more widely for the next National Security Risk Assessment (NSRA) in 2014. The NSRA is summarised in the UK’s National Security Strategy and this, in turn, informs the classified National Risk Assessment and its public version, the National Risk Register. The economic impact of AMR is being felt across the globe, ensuring that the efforts of those beyond the healthcare community will be engaged to address it. It was a major focus of the World Economic Forum Global Risks 2013 report published in February. In 2009, the European Centre for Disease Control (ECDC) estimated that AMR costs the EU approximately €1.5 billion in healthcare expenses and lost productivity each year, while the cost to the US is estimated to between $21 billion and $34 billion. Rightly or wrongly, such figures are grabbing political attention and driving international action, more so than the fact that 25,000 Europeans, just under 100,000 Americans and around 80,000 Chinese die each year as a direct consequence of a drug-resistant infections. 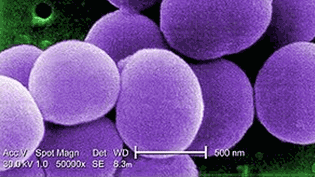 At the time of the 11 September 2001 attacks on the World Trade Center in New York, in which just under 3000 people lost their lives, more than 6000 Americans died annually from MRSA caught in hospitals, yet the issue received little interest outside of specialist medical circles. It would be more than a decade before the 2011 World Health Day was dedicated to AMR and the topic began to push its way slowly up the political agenda.